Semi-double; mature plants double flower form possible. Heavily substanced petals open yellow gold, lightly flared scarlet, center green and cream with prominent pink stigmas; fragrant. Side buds on long stems develop in rotation, a leading example of extended flowering period among peonies, up to four weeks in cooler climates. 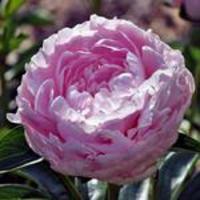 Bush is vigorous, medium height, arching but stiff stems make a widely spreading silhouette. Well-grown plants may form up to a five-foot wide mound at maturity, yielding four to five dozen blossoms over an extended period. Cool green, semi-glossy leaflets are intermediate in form between the parents, leathery and durable. 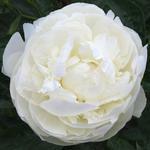 An Itoh hybrid with usable cut flower qualities and currently is used in the floral industry. Cut flower stems exhibit satisfying durability. Flowers are great in the garden or in the vase. APS seedling Certificate of Merit 1984; several times chosen to the Court of Honor at exhibitions, has produced Grand Champion of the APS annual exhibition three times. Gold Medal Award 1996. Intersectional hybrid [Itoh hybrid]. Parentage:�[Paeonia lactiflora, cultivar]�x [P. (Lutea Hybrid) 'Alice Harding']. Presumed infertile; no seed, no pollen. 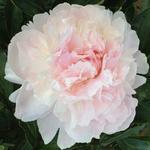 Itoh Hybrid, tree peony type, semi-double. Parentage ? Paeonia lactiflora, cultivar x P. (Lutea Hybrid) Alice Harding. First bloomed 1973. 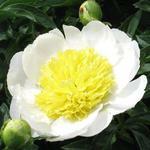 Itoh Hybrid, semi-double tree peony type flowers on herbaceous stems. Yellow petals with red highlights, 20-50 petals, prominent center of sheathed carpels and large size flowers. Very hardy, flowers produced regularly and uniformly year after year from below ground overwintering buds. Stems to 27", upright to arching, presents the flowers well out of the foliage, makes a broad low bush. Large, dark green leaves last well into autumn, making an excellent landscape subject. One to three flowers per stem, sidebuds on long stems suitable for cutting, little benefit in disbudding. Long flowering, with the mid to late season lactifloras, up to 21A weeks. Fragrant. Very little pollen. Certificate of Merit Award, 1984. Patent applied for. Seedling # 205. � �Inventor:������ Donald Hollingsworth, 5831 N.
The present invention is a new and distinct cultivar of�peony plant, a hybrid between three species, two shrubby and one herbaceous species; of the genus Pae�onia, interspecific hybrid (Paeonia lactiflora X (P. lu�tea X P. suffruticosa), combination of species now known as Itoh Hybrids. 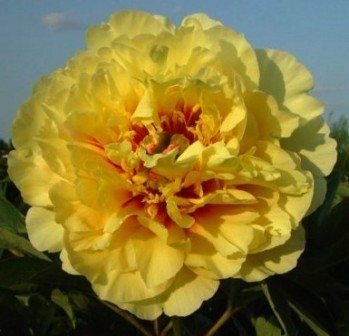 The present cultivar's uniqueness is characterized by its outstanding yellow color with a superior tree peony flower type on a singularly healthy herbaceous plant, its excellent hardiness of flower buds and consequent reliability of flowering in relatively extreme climates, and, by its distinctive foliage and plant habit.